who makes a pedal like this? Discussion in 'Downhill & Freeride' started by klunky, Jan 6, 2008. 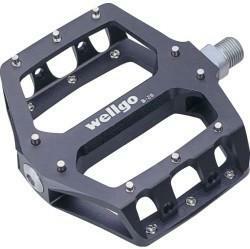 I am after a new set of flat pedals and cant find what I want. Runs on bearings not bushings. Pins are bolted from the inside of the pedal so when I clip them on rocks its easy to replace. Does not cost stupid money. I like how atom labs feel but want bearings and pedals that dont rattle/wobble and fall off the axle. welgo mg1 which arent too large platform and those are stupid lite. without spending stupid money im not sure you could get large, slim, lite, bearings, and all that. I would have to say funn vipers as well you can also adjust the pins to desire.and are inexpensive to replace,i have also hit rocks pretty hard,have lost the pins but have never damaged the threads opened the holes to an oval shape but always have been able to put new pins back in,good pedal to go with. Kona Wah Wah. These suckers are gonna be popular for sure. Thats the sucker! Looks like the same body as the atomlab! Are you sure it runs on bearings and not bushes? Any idea on durability etc? the wah wah's have a great feel on your foot. the only pair i've ridden were on another guys bike, and he wasn't very thrilled about them. When I rode them they didn't grip very well because the pin layout was terrible. He explained it was because every time he bashed the pedal on a rock, the threads would strip on whatever pins he hit. or rather, they wouldn't strip on the pin threads, but on the pedal threads for that pin, making it impossible to replace. I would hold off on them until you find out if that problem is localized or if it happens to alot of them. Welgo B26? The outboard side is a bushing, but mine are going on 10 years old with only small amounts of play just beginning to materialise. I dont mind bushings if there is a bearing in with them. Will check out the welgos ta. Should have a review on Dropmachine on them soon. have the weight of them!??! The 3rd and the 4th are, i think the same as the Konas. The weights are interesting. The wah wahs are really good, grippyness/thickness etc of an aircorp but with proper sealing and bearings. My last 3 pedals have been aircorps, funn vipers and the wah wahs. The wah wahs are way better than the other two. Aircorps did the usual bushing killing trick in a few weeks then flew off the spindle (they were 07 ones). Didnt like the funns, the platform felt so small you have to be really specific putting your foot back on, had a really small sweet spot it seemed. The wah wahs are just the business, really grippy, thin, large platform and a proper sealing system on them. And they are much cheaper than aircorps. I'm not sure why you're so set on cartridge bearings. The use of bushings is the main reason I bought my atomlabs. When a bearing fails (and they will) the whole body falls off the spindle and you're screwed for the day/weekend. There is less to fail on a bushing setup. Even if the c-clip did fail, they are much easier to replace. Yes they feel a tiny bit sloppy, but it really isn't something that you feel when you're actually riding the bike. Wait, so those are old atomlab aircorps with better bearings? rad. Too much money for a pair of pedals, I think. But looks nice! best pedal money can buy; a lot of money. not for everyone, but for the full on pro-level racer set these things are the way to go. pedal of choice for Fairclough, Cunningham, Bryceland, Rennie, Dirt. . . etc. i've got some on the way. You must have not read my post correctly. I said "Does not cost stupid money." 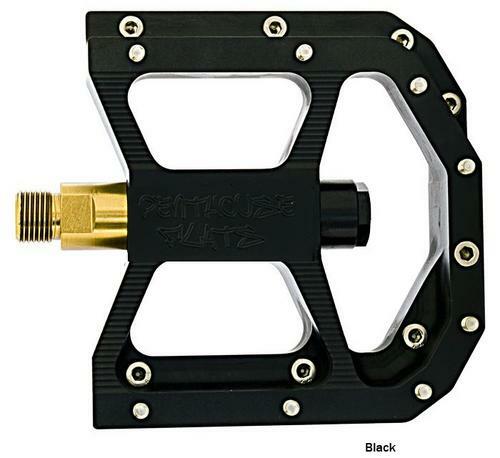 Burgtech pedals are good but in my opinion they are not more than twice as good yet they are more than twice the price of other good pedals. Also its missing some pins in the centre of the pedal! I like Wellgo B-54`s. Cheap, grippy and big. You can buy four pairs of those for a pair of Burgtech´s. Im thinking those Kona pedals are the winner so far. Also, if you bend the threads on the Wellgos, it´s really easy to drill a hole and put in a new pin/bolt from the backside. The konas look great for sure. i would consider that a good thing. Too many pins = bad. the more pins you stand on = less pressure-per-pin = less grip. I fully understand that too many pins is a bad thing, however I want a couple of pins on the ball of my foot. What about the Specialized Lo Pro Mag 2? I think they're only $75 or $80 for a pair, and they're really light for flat pedals. Also its missing some pins in the centre of the pedal! Which is why they probably work well. Jeff, when you put up your review of the kona pedals leave the weight out so people FREAK OUT. I ride the funn vipers and they are really good, changing height of pins helps change how the pedal feels alot too. They don't screw in from the back though. The Jacksh*t pedal from Kona had the same problem. I wouldn't expect it to be fixed. Sorry, these are the Wellgo's I meant. The B25s, although as others have said, Wellgo make a couple of pedals that meet all your requirements. Tioga MX Pro pedals---working well for my big feet. One thing to consider about traction pin removal with pins from the inside. If you have a bent or mangled steel pin that has to go through your aluminum pedal body, the aluminum threads are going to be stripped. With a pin that is exterior mounted---the worst case is removal with vice-grips. Just one more thing to consider. try checking at www.atomlab.com they have some huge,thin and nice one's! Has anybody here had any experience with the Sunline V1 pedals? They are thin, concave, grippy and they use cartridge and needle bearings instead of DU bushings. I have the same pedals. They aren't that thin but they grip pretty well and don't wobble at all. I think they are also pretty cheap. wellgo b-27 they are the same as the tioga mx-pro's. they last a long time. fairly light (atleast not heavy). also they are the grip kings in my book. to boot you can find they really cheap if you look hard enough. they are a bearing/bushing setup. i normally takes me over 2 years to start having a bearing problem and then i just replace it and it last 2 more years.